How do I enter my time as a Unclassified Nonexempt employee? Unclassified Nonexempt employees enter additional hours worked over their appointment percentage or FTE (i.e., hours over 40 in a week for a 1.0 (full time) FTE employee, hours over 20 in a week for .5 FTE employee) and exception time (i.e. vacation, sick) if the time off request process was not used. Note: the pay codes available to you depend on your policy profile. See Pay Codes for more information. Note: for Additional Hours Worked, only enter hours worked in addition to your regular hours for the week. 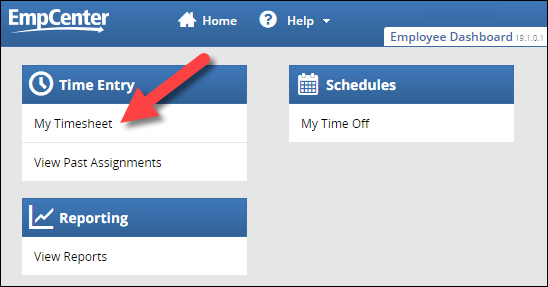 EmpCenter assumes your work hours for the week based on your FTE. For a full-time, 1.0 FTE, EmpCenter assumes 40 hours; for a half time, 0.50 FTE EmpCenter assumes 20 hours. You will only enter additional hours worked if you work more than your FTE hours. If you work over 40 hours in the week and would like to convert the additional hours to Comp Time instead of Overtime, see the Overtime Comp Requested FAQ. Why am I getting exceptions (errors) when submitting my time off requests?